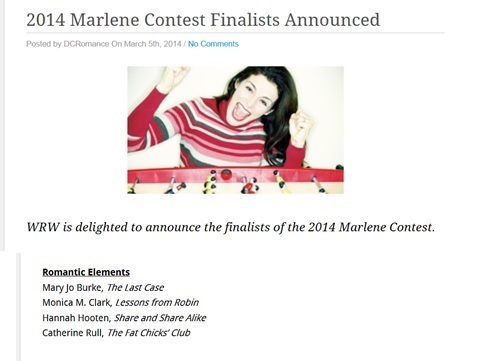 I’m a Marlene Contest Finalist! I was really excited to blog this week about the ways minority skin is described in fiction (here’s a challenge for you: try to do it without using food metaphors), but that will have to wait because I received some news. I decided to look for a contest to enter after scanning several “query letters that worked” (that is, pitch letters that led to agent representation) because they often included credentials such as winning a contest or being published in a literary journal or magazine. I decided that those credentials—rather than whether they were “pithy” or “had a hook”—is what truly made them stand out, but others may disagree. Since pitching literary journals is almost as difficult as finding an agent, I figured a contest was my best bet. It also seemed like an easy way to gain some exposure (at least 3 people read each entry) and the prize is a free critique. That’s a pretty decent prize given how expensive those things can get. The winners are announced next month at the Washington Romance Writers retreat. I wasn’t planning to go, but now I’m like why not? Many people have recommended attending writers conferences to me in the past (apparently they offer great workshops and opportunities to meet agents and editors in person). Plus, I’ve been putting off the final edits to my novel, so now I have a deadline to get it done. I’m getting this thing in tip-top shape by April 4!! Can’t wait! Congratulations! I found your Blog after reading your post on TheWritePlace about the scene list — it was brilliant, and this blog is brilliant! I can’t wait to read your post about minority skin descriptions in fiction (race in fantasy being a topic I can talk about ad infinitum). I have piggybacked off your scene list post over on my blog (post to appear Wednesday, if you’re wondering), and imagine I’ll be referring back here a bit in the future.